I made this cape in April 2018 but now during #letssewthistogether Outerwear month seemed like the perfect time to share it with you… but I forgot to publish this post! So here you go seven months later: the Seamwork Camden Cape! I have had a Seamwork membership for a few years and I’ve only sewn a few of them. I find the patterns to be generally interesting, good basics that can easily modified and customized, but I am a strange bird in the sewing world in that I tend to sew the same patterns over and over. It seems that most of my sewing friends use a pattern once or twice and then move on to the next thing. Am I wrong? Do you sew the same patterns many, many times? Or are you drawn to the newest, shiniest patterns? This is a little preview of my 2019 sewing goals, but I intend to start sewing my Seamwork patterns more often. Before I decide to jump ship on my membership (because I already have so, so many unsewn Seamwork patterns), I am going to really make an effort to sew some of them and thoughtfully review them. I sewed a Colette Nora (purchased through my Seamwork membership) this week and—spoiler alert—I love it. It’s going to be a favorite for sure. Back to the cape. I looked over the finished pattern measurements and decided to sew a size 14. That’s well below the recommended sizing for my body shape but I felt as though I would be more comfortable with the shoulder shaping in a smaller size and I think that was the right choice for me. I used a lightweight wool suiting fabric that I received in a fabric swap from my friend Dan who knows I have a thing for purple. The fabric came before the pattern choice and was the PERFECT selection for this pattern. I lined the cape with a floral crepe fabric from Indie Sew and it is the perfect surprise inside when you see the beautiful floral print. I didn’t make any other alterations to the pattern except for adding a touch of top stitching here and there. Making the button holes was kind of a disaster (Erin of vinthillknits was sitting right next to me when I was trying to stitch them and was eye witness to me picking the thread out at least twice). The solution was to add some tear away stabilizer, like the kind used in embroidery, to the bottom side of the fabric. This seemed to stop the fabric from getting bunched up in the feed dogs and made the buttonhole process a breeze! I would definitely recommend this tip to someone who is struggling with buttonholes. I have heard some complaints about capes and the restricted arm movement and I don’t disagree. But I primarily wear this cape to more formal events such a a fancy dinner out or to church when I’m not particularly inclined to do aerobics or carry heavy things like children where my arms would need more mobility. I have driven a car and pushed a grocery cart and other mundane life tasks in this cape and because of the lightweight fabric it is possible. If I were to make another version—which I probably won’t because how many capes does a girl need?—I would shorten the cape by two inches and move the arm holes up about one inch. I think these two changes would make the cape a bit more modern and the arms a little more mobile. Should you make a cape? Sure, why not. I believe the Self Sewn Wardrobe Facebook Group is doing an Outerwear theme this month so find your wool stash and silky linings and get your “coat-on” (figuratively, not literally). Lastly, want to sew some Seamwork patterns with me next year? 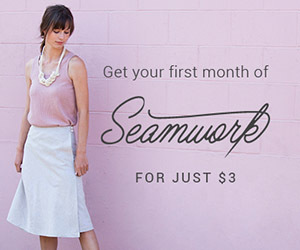 Get yourself a Seamwork membership and let’s do this! Nov 27 #letssewthistogether November is Scrapvember!